Is LottoGroove a Scam or Legit? Read Reviews! Bonus: Buy One, Get One Free! LottoGroove Exposed — How Does Jackpot Will Be Paid? It’s incredible all the different sites that have jumped on the online lottery bandwagon. Some buy tickets and some take bets. LottoGroove.com is a lottery betting site that offers sixteen lotteries and combination group play. One of the key issues of playing at a lottery betting site is how they come up with any mega jackpot payout. Throughout LottoGroove’s site, they refer to their insurer – but who is it? That could be the most important question asked. LottoGroove offers the betting on sixteen online lottery games ranging from the usual big four – Powerball, Mega Millions, EuroJackpot and EuroMillions – to New Zealand Powerball and some of the US state lotteries and a few Latin games. Players can play 1 line or more. Subscriptions are available up to 52 weeks. There are no discounts for multiple plays. Newbies get a buy one get one free offer. Any purchase is final – non-refundable, can’t be canceled. 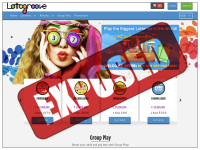 LottoGroove.com offers six packages for group play – Big USA, Euro Zone, Atlantic Pack, Kiwi Ozi, Hot Latin and Daily Global. Let’s take Big USA as an example. It has 60 lines with 170 shares which means 35 Powerball and 25 Mega Millions ticket lines though when looking at the actual list of tickets it refers to 2 draws each order. To put it more bluntly, 35 Powerball ticket lines are shared with 170 people/shares. The rest of the group play options left me baffled. Take the Kiwi Ozi group play. LottoGroove.com says on the main page that it is a share of 407 lines but clicking on the actual tickets they total 60. I don’t get it. Add to this the overall ratio of tickets to shares per draw – just not good enough. Basically, LottoGroove says they will pay out what is advertised in the actual official lottery results. There is a spreadsheet on the site that does list all the different payouts for each of the lotteries. But, there is some small print that gets into that the jackpot amount will depend on how many winning tickets there are including the official lottery and LottoGroove.com winners. Winnings up to €50,000 can take up to thirty days to reach you. Winnings over €50,000 could take longer while LottoGroove.com’s insurer processes the money. That’s how LottoGroove covers winnings – through an insurer. The only problem is there is no information on their site as to who this is. Sometimes they say they do actually buy tickets and may need help to collect the winnings. LottoGroove.com will “reimburse any reasonable expenses”. Any withdrawal will take two to five business days to process and then up to another fifteen days to get to you. Transfers are done to your original deposit type. Any transfer that goes to a bank account has a processing fee of €25. Besides the usual you’ve got to at least 18 years old, residents of Afghanistan, China, Cuba, Dutch West Indies, France, Hong Kong, Iran, Israel, Myanmar, Netherlands, North Korea, Singapore, Turkey, and the USA can’t win here – so don’t bother playing. LottoGroove.com has a UK phone number, email address and online chat available 7:00 am to 4:00 pm GMT. It is operated by a company registered and licensed in Curaçao but there is no snail mail address. The online chat is pretty cool though I am wondering how many people “Amber” is as they use an avatar. Would you mind rating LottoGroove.com? The chance to play online international lotteries is great. But, I want to know that the site I’m considering betting at definitely has the insurance in place to pay my winnings – especially if I won that mega jackpot. Online chat couldn’t answer the question. I also like to play in syndicates/group play and the ratio offered just doesn’t work for me. This site gets a thumb’s down. There are too many other options out there and the bottom line on playing online is to have confidence in the provider and their ability to pay. I never realized they never actually bought the ticket and that they insured themselves ie they carried the risk. Pity, playhugelottos.com cannot be played from SA or do they use the same methodology of assuming all the risk? Its managed out of South Africa, how can you check on them, chances are they don’t answer calls (too expensive anyway), don’t have an email, or don’t respond. Not that local is any better (ANC EFFing managed) at least you can break down their door and throw in a grenade to get a response!